April is mostly dry so adequately water your lawn and plants while keeping an eye on the areas water restrictions, don’t over-water. With a proper layer of mulch in your garden, you can retain moisture and reduce watering needs. Mulch also will control weeds and protect roots from the coming high heat. This is a great time to renovate a lawn, power rake Bahia grass and verticut St. Augustine grass. We had a few freeze events this winter, so cold-damaged branches can be a problem dependent upon where you live so pruning might be necessary. Remember, for pruned plants you’ll need to fertilize an amount for what the plant was prior to the freeze as the root system is still that of a larger plant. Pruning for freeze-damaged plants isn’t the only pruning that needs to be done either, prune flower shrubs after blooming too. Bring color to your flower garden with summer annuals and plant your late spring and early summer vegetables. Use plenty of compost, peat, and manure in the soil. Fertilize lawns and shrubs that haven’t received a spring feeding. Feed azaleas with a special acid fertilizer after they bloom and feed palms with a fertilizer containing manganese. Spray fruit trees now with a nutritional mix to protect the fruit and control melanose, a fungal disease. Check for whiteflies, spider mites, and powdery mildew on plants and treat promptly. Acephate will control the damaging thrips on roses, gladiolas, gardenias, and other flowers. Thuricide will control caterpillars but not harm beneficial insects. 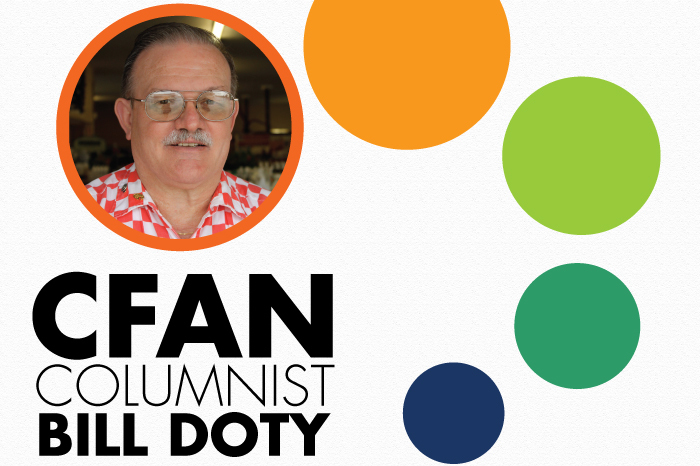 BIO: William R. “Bill” Doty is the owner of Doty Farm and Garden Supply Inc., founded in Winter Haven in 1954. Bill graduated from Winter Haven High School and Florida State University. Growing up, he learned valuable lessons in listening and asking questions and was a student of the family business. Bill shares his knowledge with his customers daily and with our readers monthly.